keeps the toe shivers away. I just finished my first sock (started here) and it’s a size too big. I can now appreciate more the women that made and mended socks for their families. I would make socks of a certain size and just rubber band or attach buttons for tightening for little kids to grow into them. I thought this might have been where the idea for leg warmers came from – sock too small, just cut the toes off; but it seems ballerinas get the credit for wanting to keep their legs warm and cramp free during practice. I made it from top-to-toe and while working near the cuff accidentally turned my work inside-out causing the yarn to bubble there (perhaps a personal design). I’m proud of my heel flap and heel turning abilities, but my gussets ([supposed to be] triangle bringing the heel back to the top of the sock) was done on the wrong needles so that instead of decreasing down the sides, my work was decreased more on the top. 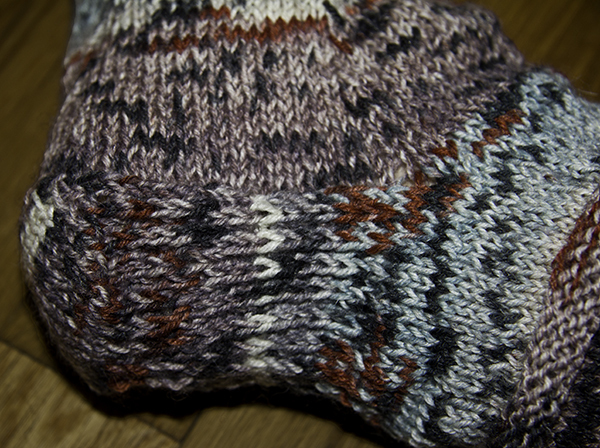 I have a lot of ladders (rung-like gaps from loose knitting with double-ended needles) throughout the sock. Thanks to Caroline for yarn, pattern, and guidance! I am proud of this sock and look forward to wearing a pair…though with practice I’m guessing the second sock is going to look a lot different. I kept no count of rows or notes on design so it will be difficult for me to attempt the same ‘mistakes’ for a second time. The pattern I used wasn’t as descriptive as I needed for a first time socker so I looked to YouTube for help which hasn’t failed me yet. 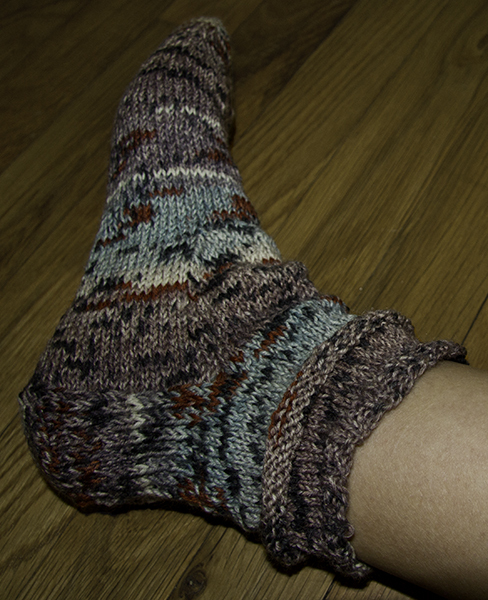 And I’m going to make the second sock a size smaller. I’ve always been a fan of mismatch socks and now have the ability to make my own – in all their differenty goodness. 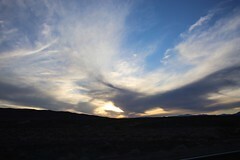 This entry was posted in Education, Fiber Arts and tagged clothes, colors, knitting, skills, website. Bookmark the permalink. This one put a big smile on my face – cute story and neat that you are so curious to learn these esoteric skills. The sock looks great. You are a natural born socker. My wife just got into this and now all the kids have scarfs and hats. She takes a lot of pride in it too. Good work! congratulations!!!!! so proud of you! !